The Hub Recreation Center is a 64,000 sq. 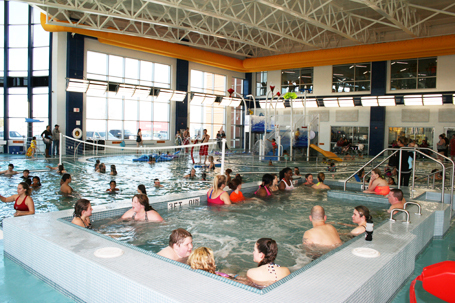 ft. indoor recreation facility providing aquatic health, fitness, and sports activities for youth, adults, and seniors. The facility includes three pools, lounge area, snack bar, gymnasium, first aid, party rooms, conference room, youth center, locker rooms, pool viewing area, and childcare for guests. The main attraction is the Heartland Regional Aquatics Center, which provides family recreation and learn-to-swim programs. Located on the west side of the facility, three different pools fill the one-of-a-kind natatorium. 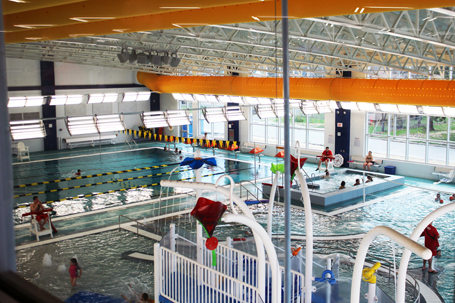 A six lane, 25-yard lap pool hosts swim lessons, water aerobics, and swimming competitions. The 3,400 sq. 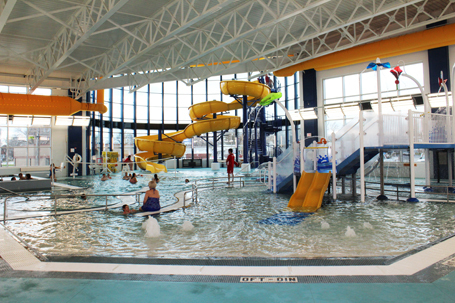 ft. recreation pool features a waterslide, lazy river, basketball hoop, volleyball net, exercise area, vortex, and wading area with a sprayground. In the middle of the two larger pools sits a 175 sq. ft. therapy spa with space for up to 17 people. The therapy spa offers rehabilitation, relaxation, and healing for many residents. After completing design services for the aquatic center, the city retained the team of Counsilman-Hunsaker and Sports Facilities Management to provide Pre-Opening Management Services and ongoing Full-Time Management Services for the first six months of operation.